optimizes both formulation and product properties. Poraver® is the preferred lightweight aggregate for dry mortar and construction chemical products. The innovative lightweight filler with its positive characteristics meets even the most demanding product requirements. Poraver® is ideally suited for combination with lime, cement and other binders. Its spherical grain shape and low density optimize the formulation as well as the material properties of your products. Poraver® enables higher yield and higher layer thicknesses and makes workability noticeably easier. 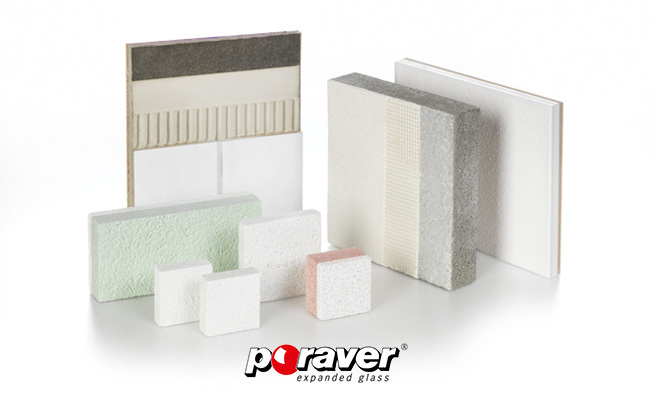 In addition, Poraver® is characterized in plasters, renders and stuccos by excellent thermal insulation and sound-absorbing properties, a class A fire safety rating as well as resistance to UV radiation and microorganisms. The spherical grain shape of Poraver® improves the trowelability through a ball-bearing effect. The low grain weight increases coverage up to 60 % in comparison to standard adhesives. In addition, Poraver® reduces the e-modulus (young's modulus) of the adhesive for less cracking. Because of its creamy-white color, it is also suitable for the manufacture of white marble or natural stone adhesives. Poraver® scores in base coats and reinforcement mortars or stucco base coats with increased flexibility and crack reduction. The low density of Poraver® results in very good thermal insulation properties as well as reduction in weight and higher area coverage. The ball-bearing effect of its granules offers significant advantages in terms of spreading behavior and application properties. With its low bulk density, Poraver® fillers have a yield up to 35 % greater and decrease the weight per unit area – ideal for static requirements during renovations. Poraver® additionally reduces the e-modulus which minimizes crack formation. The low weight facilitates mixing of the mass. Crucial for the use of Poraver® in renovation render is the fact that the lightweight renders are permeable to water vapors and accelerate the drying of wet surfaces. Due to the high grain strength of Poraver®, a low proportion of binder is needed which has positive effects on thermal conductivity. Because of its low weight per unit area and elasticity module, it can additionally be used on bases with low strength and low load capacity, as is often the case with historical buildings. Poraver® is ideally suited for the restoration of historic masonry. The desalination compresses consist of the clay mineral bentonite, cellulose fibers, silica sand and Poraver® as a lightweight aggregate. The materials are mixed with demineralized water so that the mixture can remove a particularly large amount of salt from the masonry. Up to 1.6 kg/m² salts can be absorbed by the compress. For this purpose, the desalination compresses are sprayed onto the masonry to be treated. Thanks to Poraver®, greater layer thicknesses can be applied. Correspondingly large amounts of salt can thus be removed from the damaged sandstone. glass granules for your application? No problem!